Last week was the first week with the full complement of code club members, new and returning. We filled the computer lab again. 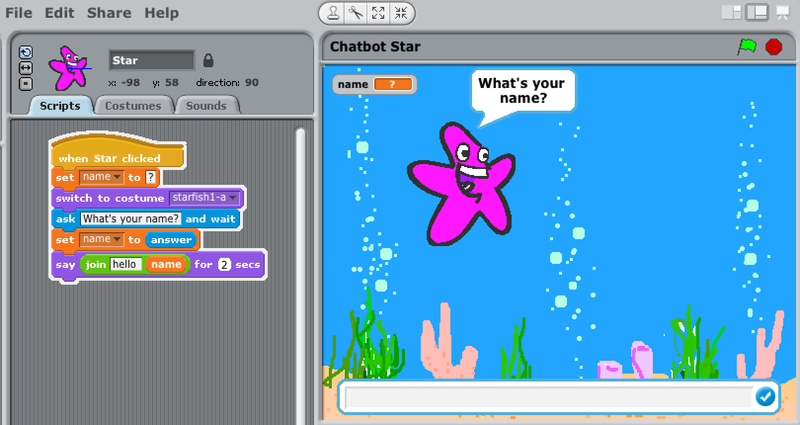 I had a Code Club World project that was new to all of them called Chatbot. 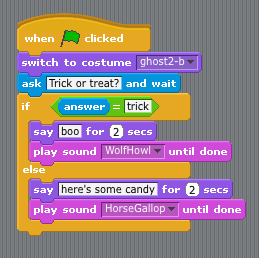 I picked this Scratch project because it introduces “ask and answer” code blocks and “if statement” code blocks. 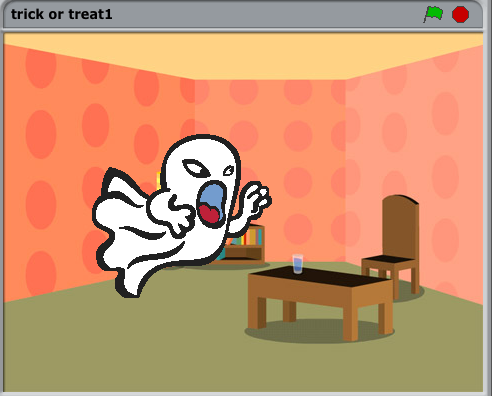 Also, the project wasn’t your typical video game. 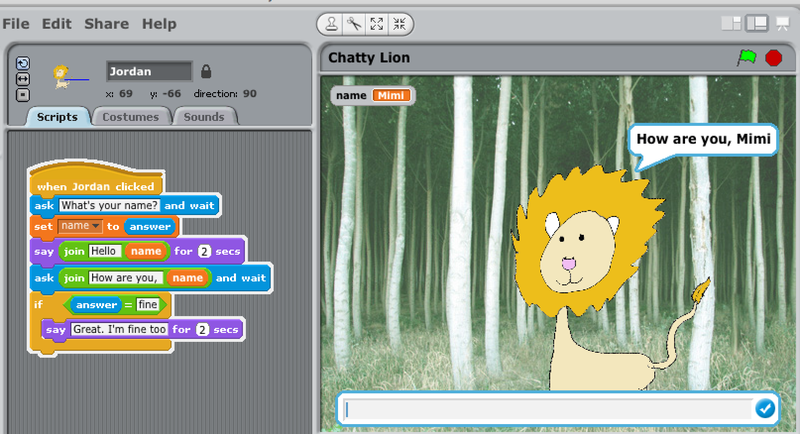 Chatbot is a new project that has just come out of “beta” testing so it used some aspects of Scratch 2.0 that aren’t available to us as our lab has version Scratch 1.4 installed. 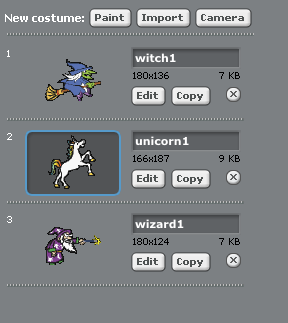 For example the characters the project says to choose from are all 2.0 sprites. So I wrote a couple of my own versions of the project to demo to the students and let the students pick a sprite of their choice for the project. It seemed to be a basic project that with a bit of creativity on the student’s part could become really fun. I also liked that the project introduced the “join” block. It reminds me of the Java print command. The students noticed that if you want a space between the things you are joining, like words and the name variable, you have to actually add it. The project didn’t take too long. 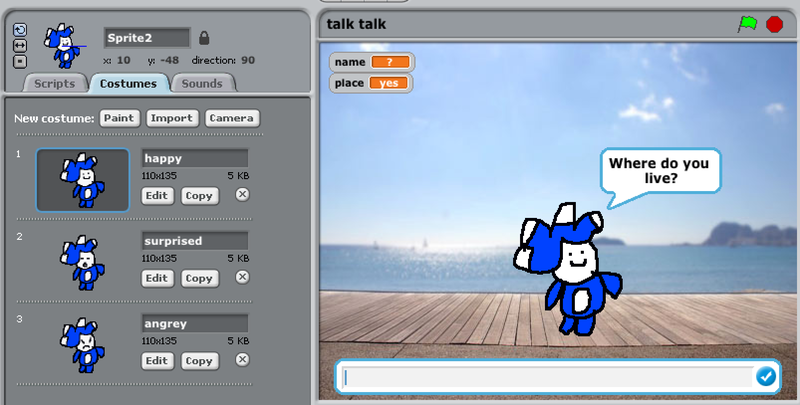 Some students were finished and wanted to work on last weeks projects or projects from the first session, others were really getting creative with Chatbot. Alex, my high school volunteer, and I were noticing how smoothly things were going. There was energy in the room, but it was all focused on the tasks at hand. 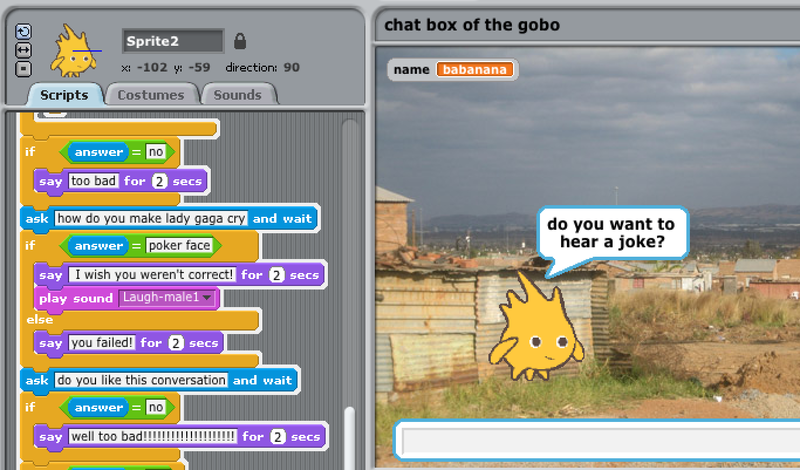 We stopped to enjoy the moment where everyone was enjoying themselves and playing with Scratch. 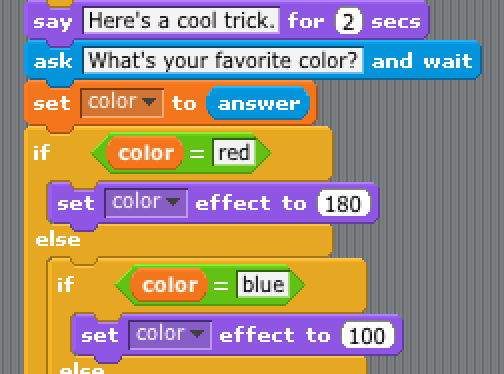 My husband asked if anyone asked the question “What’s your favorite color?” and had the Sprite change it’s color effect to match the answer. What a cool idea. 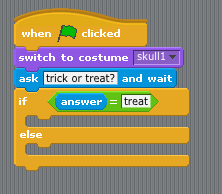 I’m not sure how to do cases in Scratch, so I just went with if statements. I’ll ask my high school student volunteers (yes, I’ve got a second high school student this term). It’s very exciting. This coder drew her own Sprite like Scratch 2.0 Tera with different costumes for different emotions.